For quite some time, the human race has longed to create crops that are adaptable to any type of weather, mainly floods. This would benefit us in many ways, since we lose so many crops due to field flooding. If our crops could survive through floods, then there would be less of an economic impact in the affected area, as well as a steady food supply in the surrounding communities. 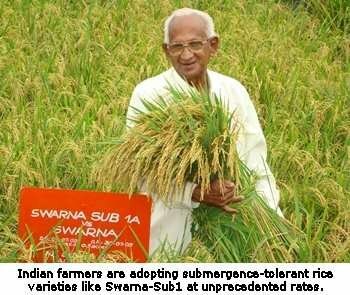 This video exhibits how rice with the Sub1 gene lasts longer and grows better than normal rice. Also notice, that the Sub1 gene crop(on the left) grows better and lasts longer in the flooded fields.